We invent and develop solar-powered garden light products. Every product on this website is patented -- that means we invented it! Set of 24 Crackle Glass Solar Color-Changing & White LED Path Lights - Sparkle By Day, Then Put On A Light Show At Night. 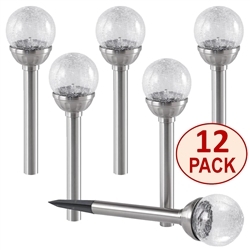 Set of 12 Crackle Glass Solar Color-Changing & White LED Path Lights - Sparkle By Day, Then Put On A Light Show At Night. Set of six Solar garden stake lights that automatically changes through 7 colors at night. 2.5” dia. 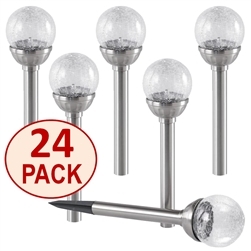 transparent crackle glass globes, 1 Color Changing 7-color auto blending LED bulb in each light; 1 x AA Ni-Cd Rechargeable Battery included in each stake, Two height levels; Each light is independently powered by the sun. 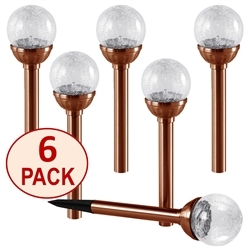 30" tall Set of 6 Crackle Glass Solar Color-Changing & White LED Copper Path Lights - Sparkle By Day, Then Put On A Light Show At Night. Set of three Solar garden stake lights that automatically changes through 7 colors at night. 2.5” dia. transparent crackle glass globes, 1 Color Changing 7-color auto blending LED bulb in each light; 1 x AA Ni-Cd Rechargeable Battery included in each stake, Two height levels; Each light is independently powered by the sun. 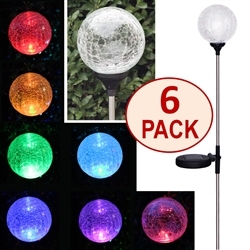 30" tall Set of 6 Crackle Glass Solar Color-Changing & White LED Path Lights - Sparkle By Day, Then Put On A Light Show At Night.